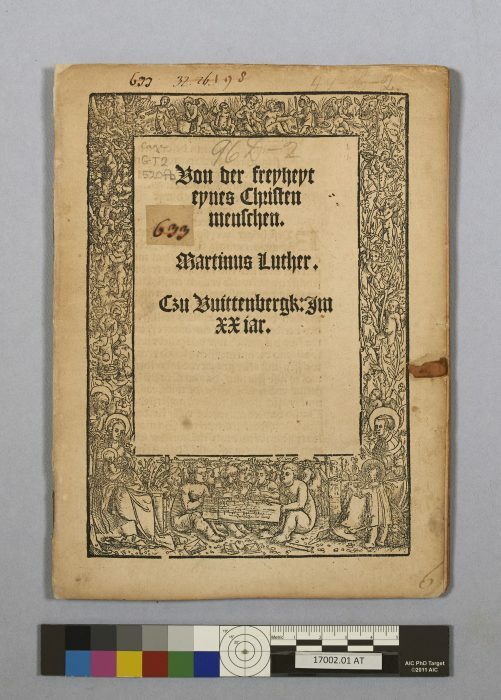 In preparation for the Burke Library’s upcoming exhibition on Martin Luther, I am examining and treating some of the Library’s many Luther pamphlets. 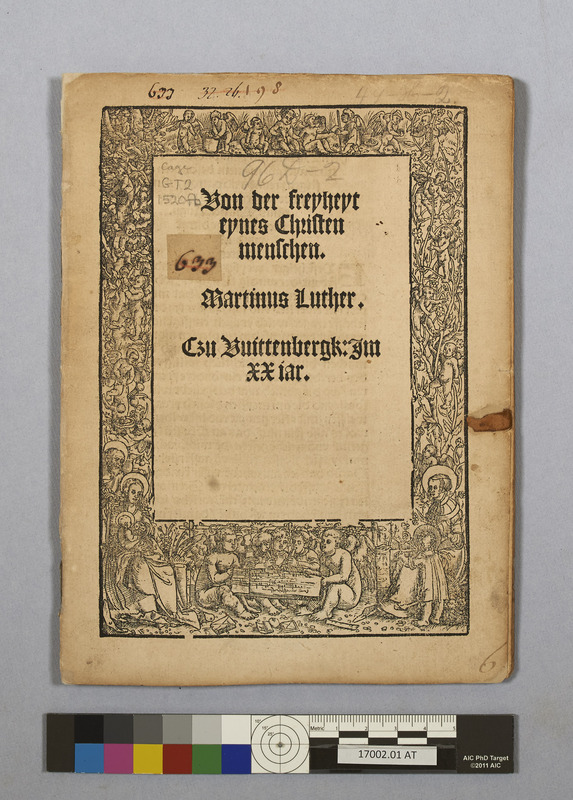 The Library holds thousands of pamphlets, and more than two dozen relating to the Reformation will be featured in the exhibit. 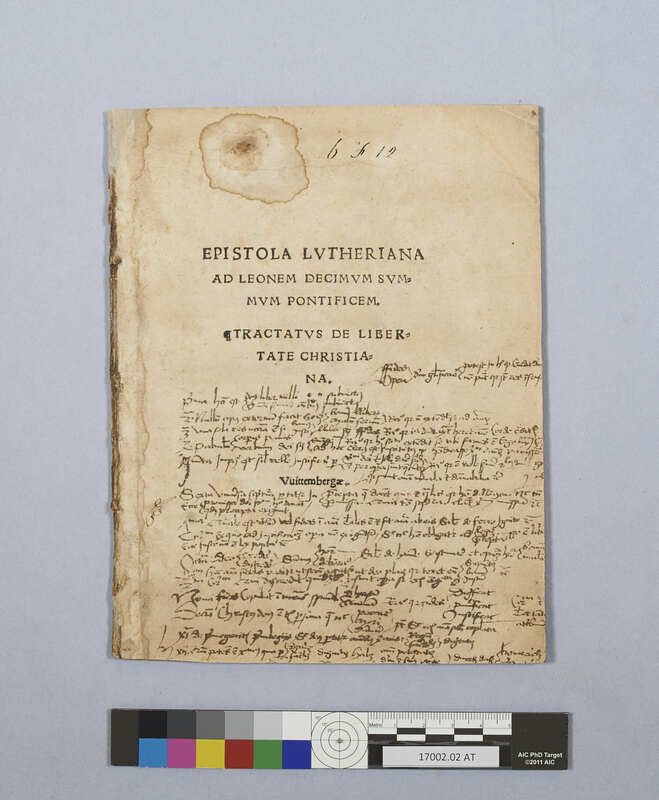 The sewing in this 1520 Luther pamphlet had broken and several leaves were detached (left). 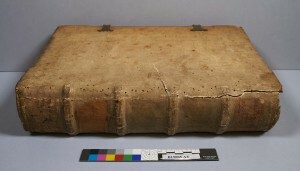 The spine folds were mended with thin Japanese tissue and the pamphlet was resewn through its original sewing holes (right). The few remaining fragments of the original sewing thread were left in place. 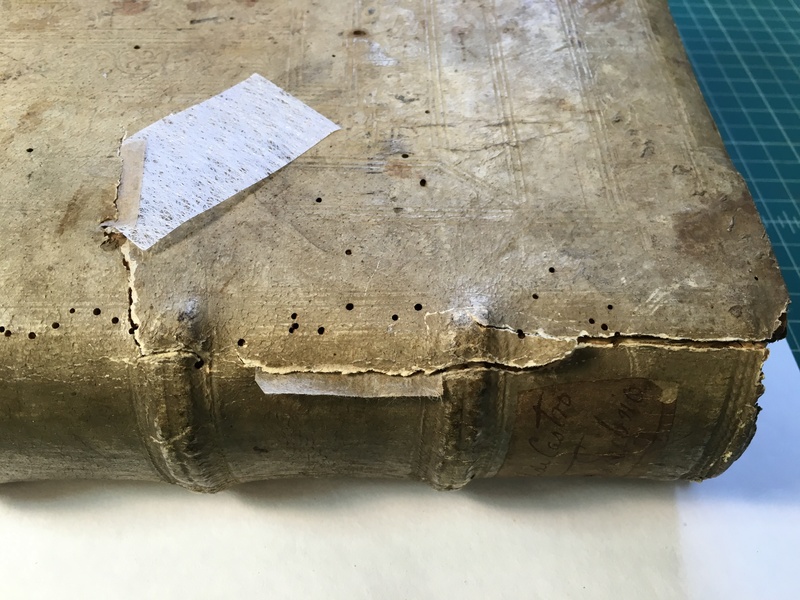 The Conservation Department works with the curator, Matthew Baker, to ensure that any items in unstable condition are conserved: tears are mended, loose leaves are reattached, and the parts are made whole again. The first leaf of another pamphlet was tearing at the spine (left). The leaf attachment is stabilized with thin Japanese tissue hinge (right). This small mend minimizes the risk of greater damage occurring in the future. Extensive notes were made throughout this pamphlet. The remains of a small brown leather tab on the fore-edge indicate a former leaf tab marker, added when this pamphlet was bound in a collection. At nearly 500 years old, these pamphlets bear witness to their past use. Extensive notes in the margins, underlining, manicules, and comments are the legacy of past readers. These annotations form an added dimension of interest for scholars today. While these items were originally issued as individual pamphlets, many were later bound together in collections. Some have been disbound and rebound numerous times as they passed from library to library. There is much to be learned about this history of ownership from the physical evidence: sewing thread in the gutter, layers of paper adhered to the spine, colorful decoration on the edges, exact page dimensions, and leather page markers all carry information about past bindings and collections. 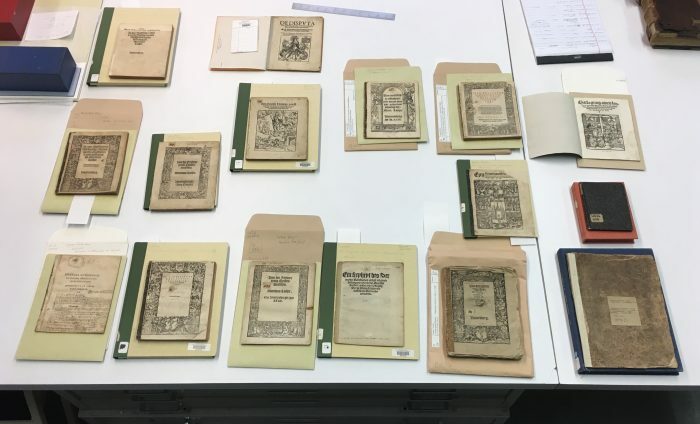 Any conservation treatment of the pamphlets must consider all of these forms of information–the printed text, annotations, and the physical evidence–to ensure that they are preserved for future scholars. I hope you will visit the exhibition this fall in the Rare Book and Manuscript Library’s Chang Octagon Room and enjoy these remarkable windows into the past! This entry was posted in Collections on March 9, 2017 by Morgan Adams. 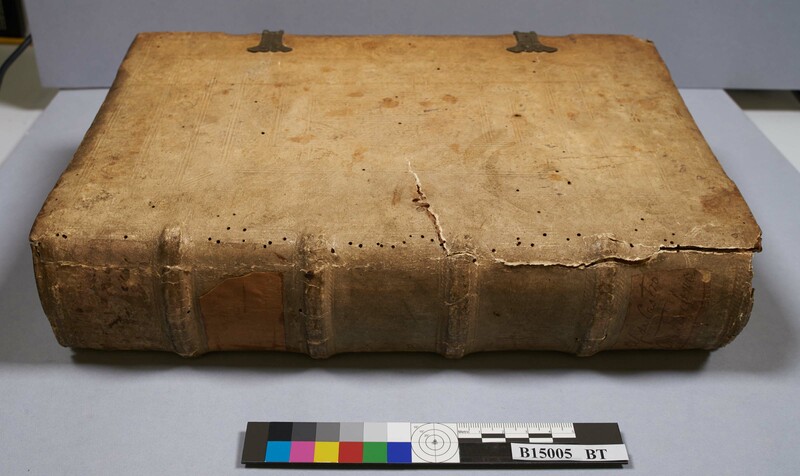 An important history is preserved here, encoded in each binding’s structure and materials. Bookbinding in this period was done by hand, learned from a master and passed on to the next apprentice, and there were many practices that were highly regional, sometimes even particular to individual workshops. Structural features that are inconspicuous in the finished book, such as the manner of sewing or the attachment of the endsheets, or features that seem insignificant, such as whether the clasp’s catchplate is placed on the upper or lower cover, can actually provide crucial clues as to where and when the book was bound. This information is not found in any other aspect of the book. Binders of this period rarely signed their work and very few bindings are dated; furthermore, books were commonly sold as unbound sheets, so that the date and location of a book’s binding could be entirely independent of the date of printing. 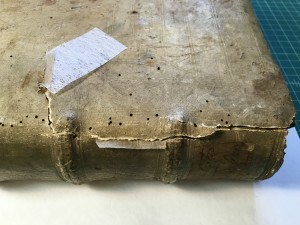 Given the unique evidentiary value of bookbindings, their conservation poses some interesting challenges. How do we repair the volume that is prized for its unrepaired state? Future scholars will want to see the same features of the book that I want to see today. And yet these books are fragile–their structure may be intact but the materials have aged and cannot function like they used to. Many covers have become detached, or hang on to the text block by a single thread (literally). Wooden boards, weakened by insect damage and worn by centuries of use, have split. Covering materials are torn, spines are fragmentary, joints are splitting. If these books are to be consulted by scholars, some conservation intervention is required. It is my job to ensure that these magnificent bindings are preserved to tell their story to future scholars. Recently I completed treatment of Alfonsi de Castro’s Ordinis Minorum Regularis Obseruantiæ almæ prouinciæ sancti Iacobi Aduersus omnes hæreses libri quatuordecim, printed in Cologne, Germany, in 1549. The book’s wooden boards are covered with alum-tawed skin, which has become rigid with age, and is torn along the joints and on the front cover. Opening the book strained the covering material along these tears. Without conservation, these tears would likely grow. An intervention to stabilize the cover can prevent future damage. This photo taken during treatment shows the small pieces of Japanese tissue, a strong yet thin paper, that are used to bridge the two sides of the tear, preventing the tear from enlarging. The tissue “v-hinge” allows the covering material to move when the book is opened and closed, yet prevents the covering material from pulling away from the book any further and causing the tears to spread. After treatment the book does not look very different from before treatment, however the cover is stabilized. All treatment is carefully documented, so that scholars studying the bindings can recognize the materials I added. Additionally, conservation treatments are carried out using techniques that allow them to be removed later without damage to the original. This entry was posted in Collections on March 18, 2016 by Morgan Adams.